Dublin’s latest Style Club: The One! Ladies and gentlemen (ok, probably just ladies but if you’re reading boys, do say hello!) I have a momentous announcement to make. After years of searching I think I have finally found The One. No, not Mr Fluff, darling that he is, but something much more elusive: the Perfect Hairdressers! When I was invited into Dublin’s newest Style Club on North Earl Street, Dublin 1, I was excited, but a teeny bit anxious. These design-led salons are bang up to the minute, feature cutting edge trends and pump out the latest tunes – would it all be a little too much? 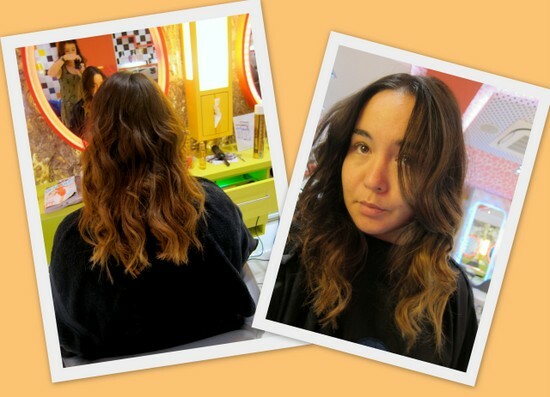 Turns out I loved every minute, and that’s partly due to the amazing design of the salon – from the bright neon colours and wall of LCD TV screens to the polka dotted ceilings and vibrating massage chairs – but mostly due to the excellent staff, especially my super stylist, Niamh. Finding The One is as much about personality as it is about talent, service and environment, and Niamh is all-round fabulous – plus, she really seemed to ‘get’ my hair type and requirements. In her talented hands my hair was expertly ‘marbled’ (a type of ombre technique) and then given a colour pop treatment for tone and shine. The results were everything I’d hoped for, and my next appointment is already booked in. The Style Club on North Earl Street (D1) is open Monday to Saturday with late night openings on Wednesday and Thursday; they’re also running introductory offers, so check out the website for more. Have you found The One? Tell all in the comments! Oh, and psst! If your hair's in need of a bit of TLC, check back to the site this afternoon for my latest giveaway! My ombre has nearly grown out- I have an appointment booked at my 'the one' the day after I'm home at Christmas! Love your hair! And that salon looks really cool! I love the orange mirrors! Your hair looks gorgeous Emma & I love the funkiness of the salon...my kinda place! very cute look! it does look like a really fun place! I'll need to find a new hair dresser once we move to Dublin (going back and forth to Belgium is probably not a good idea :-p) and I have to say, this looks good! My hair is currently purple, blue, green and blonde...its suppose to just be purple haha I'm going to have to sort it out before the blogger meet up! This salon looks so exciting! Would love to get my hair styled there. Emma your hair looks fantastic! I love how natural looking the colour is, it really suits you and it looks so healthy and long! I love the look of this place. I'm due a haircut very soon so I think I will take you advice and book in here! Aw thanks guys! Emma - let me know how you get on!